James Mallows has a bit of revenge in mind this weekend as Whitworth gear up for an important ChromaSport & Trophies United Counties League Division One home clash with Melton Town. The Flourmen sit in eighth place going into the game while Melton are fifth but just one point separates the two teams. It will be their second meeting this season after Melton claimed a 4-2 home win at the start of October. And Mallows is hoping his team can set the record straight at London Road tomorrow (Saturday). He said: “When we played them away, they demolished us to be honest. It was our worst performance of the season. “So hopefully we can gain a bit of revenge on them and get the three points. “It won’t be easy because they have really found some form and are going well. “It’s a tight division. Anyone can beat anyone on their day. 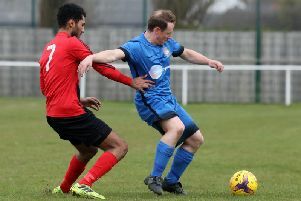 The Flourmen made light work of seeing off Northants Combination side Corby S&L Khalsa in the second round of the NFA Junior Cup last weekend as they romped to a 9-0 success. And Mallows insists his team are in that competition to win it. “I think they had a bit of a depleted team so it wasn’t a very even contest,” he added. Elsewhere in Division One this weekend, fourth-placed Raunds Town head to strugglers Woodford United. There is a local derby at Occupation Road as bottom side Stewarts & Lloyds take on Irchester United while Burton Park Wanderers face a tough trip to third-placed Olney Town. Rushden & Higham United will also be aiming to advance in that competition when they take on Towcester Town at Hayden Road.